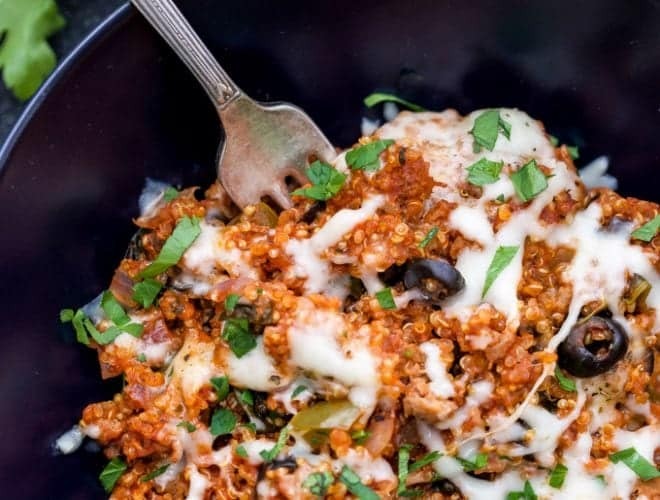 One Pot Supreme Pizza Quinoa Casserole is a great way to get your pizza fix, but in a healthier and more wholesome way. You’ll love how easy and how quick this one pot meal is to make! Hi friends! Danae from Recipe Runner here today and I’m so excited to be back sharing monthly recipes with you this year! I can’t believe this will be my 3rd year doing guest posts on Ashley’s wonderful (and beautifully redesigned) blog. To start the year off, even though January is nearly over, which is crazy, I’m sharing an easy one pot dinner. 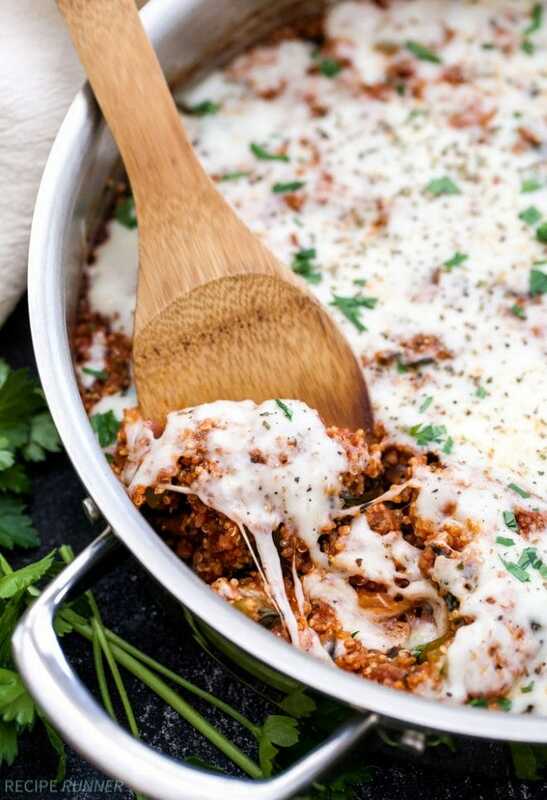 One pot supreme pizza quinoa casserole is perfect for that pizza craving, when you want something a little less greasy and a little more wholesome. I don’t know about you guys, but I get a pizza craving at least twice a week. Usually once on the weekend and then again during the week when I’m not in the mood to make dinner. Ordering a pizza is such a tempting idea when you don’t want to cook, but when each slice is packing nearly 300 calories and you know you’ll eat at least 2 or 3 slices, it’s probably best to come up with an alternative. My alternative is to make healthier “imposter” versions of the foods I love and to make them as quick and easy as possible to get on the table. The faster they’re on the table and in my mouth, the less time I have to think about picking up the phone and ordering that pizza. The idea for this One Pot Supreme Quinoa Casserole came from popular Turkey Taco Quinoa Skillet recipe that I shared here last January. It seemed only fitting to come up with a new version this year. What’s great about this pizza version is you can customize the toppings to what you and your family like. I chose to use Italian turkey sausage, bell pepper, red onion and black olives. Not a fan of olives? Use mushrooms instead. Want to make it vegetarian? Just omit the sausage. The most important part of this recipe is making your own pizza sauce. This sauce is what I use for all my red sauce based pizza recipes. I love making my own because the flavor is far superior than anything you’ll buy in the store and it’s made with simple ingredients that you probably already have. Forget dialing your favorite pizza place this week and try making this healthier and far more filling One Pot Supreme Pizza Casserole instead! Over medium-heat spray a large skillet with cooking spray. Add the sausage to the skillet and crumble with a wooden spoon. When the sausage is cooked add in the red onion, bell pepper, minced garlic, spinach and olives. Sauté for a couple minutes until the vegetables start to soften. Add in the basil, oregano, parsley, garlic powder, red pepper flakes, tomato paste and tomato sauce and stir until everything is combined. Add in the quinoa and water and stir to combine. When the mixture starts to bubble, cover with a lid and cook on medium low heat for approximately 20 minutes or until the quinoa is cooked and the liquid is absorbed. Top with the mozzarella cheese and cover with the lid cooking another minute or until the cheese is melted. Skillet – This inexpensive stainless steel skillet is the one I use in most of my skillet recipes. Wooden Spoons – I love these olive wood spoons! Chef’s Knife – A chef’s knife makes cutting the onions and peppers easy! Just made this for dinner tonight, it was pretty good! I'm not a fan of green peppers, so I swapped the green peppers for fresh mushrooms that I diced up and used a 10oz. package of frozen spinach. Going to take the rest of it into work tomorrow to share with my team, hope it is even better as a leftover lunch! ? Hi, Kristina! I am so glad to hear you loved it. The fresh mushrooms are a great substitute. Enjoy your leftovers! I can eat tomato products with no problems But, there are people that have an allergy to tomatoes and can not use tomato paste, tomato sauce, marinara sauce ..etc. Would like to see more recipes using something other then tomato products and, have the same great taste. Hi, Debi! I'd love to help create other recipes. Ajvar is a good substitute for tomato paste http://amzn.to/2p778Lt (affiliate link). Do you have any suggestions for other ingredients that have the same great taste as tomatoes but aren't tomatoes? Pizza and quinoa? Yes, please. This casserole sounds soo amazing and perfect for dinner. Thanks for sharing on FF! This looks so good! Gotta love any one-pot dinner, right? Thanks for sharing this with us at the Home Matters Link Party:) Following you on Pinterest for more yummy recipes. Yes, yes, yes! We love quinoa & we love pizza, although we rarely eat pizza, so this is the way to go for us! Thanks for sharing with us at Funtastic Friday! Looks good! I'd have to make a few substitutions but I think it's still doable. Looks so good. All the flavors of pizza but, healthier. Thanks for sharing at the Inspiration Spotlight party. Pinned & Shared. I have not cooked anything with quinoa but this may be my first attempt. It looks great. Thanks for sharing at Over the Moon.